"Everything needs good fortune, even the Sefer Torah in the heichal". This maxim of the Zohar could well be applied to the 300 years old Sefer Torah which was found seven years ago in a cave in the northern coast of the island of S. Miguel, Azores. The finders were two school boys of the shabby fisherman's village of Rabo de Peixe. Unaware of the importance of their finding the children vandalized the scroll, leaving it as a bunch of parchment fragments. Some fragments they gave away, others they even sold to people who had in mind making a profit on them. I have first learned about it, by mere chance, on May 9th, 1997, two days after the finding. I had clicked incidentally on an Internet link to a newspaper of the Azores. It was the "Aחoreano Oriental" and there it was as a hot item in the front page. The day after the finding the kids took some fragments to school. Their teacher of religion soon recognized the writing to be Hebrew, and one of his colleagues had the good sense to climb the rocks with the boys, and enter the cave She came back with the remains of the scrolls, some with burned edges, and delivered them to the Regional Library and Archives, whose director in turn started an operation to recover at least part of the fragments dispersed among the villagers. On the subsequent days there were many fanciful accounts in the press about the "two scrolls", as they seemed to be after being cut by the children. Those accounts varied from the cave being a secret place of worship for Crypto-Jews to the accomplishment of a certain prophecy by Pope John XXI. It was obvious from the perfect condition of the bag that held the scroll that it had been laid there quite recently. My long experience with secret communities of crypto-Jews in Portugal and with many Inquisition files led me to discard as highly improvable the possibility that any marrano had a Sefer Torah in the Azores..
Not because there were not New-Christians in the Azores. Many of them came from continental Portugal, since the 16th century, on an attempt to evade the vigilance of the Inquisition, which had no tribunal in the Azores. However, as early as 1555, the Bishop of Angra, Jorge de Santiago, has denounced to the Holy Office in Lisbon, two groups of New-Christians in his area of jurisdiction, who were caught practicing certain Jewish rituals in secrecy. Some were embarked to Lisbon, by order of the Inquisition. From that time on and up to 1802, the Church authorities in the Azores were after judaizers, and also after other heretics and sexual prevaricators. This included frequent inspections in search of forbidden books into ships moored at Azorean ports. In point of fact they were not very successful. Throughout that period only 112 individuals from the Azores were condemned to different sentences by the Lisbon Inquisition, of them only 26 on charges of Judaism. However those judaizers did not possess any Sefer Torah, or for that matter any Jewish object of cult. Should they be caught with any, this would mean certain death at the fires of the Inquisition. The most probable assumption was that this Sefer Torah had belonged to one of the Moroccan Jews who settled in the Azores as from 1815 and then began leaving the islands approximately in 1870, to continental Portugal, Brazil and the United States. They lived in several islands of the archipelago; they owned four (at one time five) small domestic synagogues, in which they kept Torahs. With the exception of one that was taken by his owner to the Oporto synagogue, the others converged to the synagogue of Ponta Delgada (capital of the Azores). The building of this synagogue is presently in very bad condition. Consequently all four Sefer Torahs concentrated there were taken to Lisbon. As a first thought on how to find out from where the Rabo de Peixe Sefer Torah came, I wondered if it had a mantle and if somebody had thought that the name of the owner might be embroidered on the mantle as it was customary. A telephone call to the director of the Ponta Delgada Archives gave me an unexpected answer: yes, it had a plain velvet mantle with no embroidery. But from his description I learned that the mantle was machine sawn (not so old then) and was styled according the Ashkenazi usage. Moroccan Sefer Torahs, including all those still held at the Lisbon synagogue, have a vertical opening in the back of the mantle allowing the holder to insert his right hand to embrace the scroll. Ashkenazi mantles are closed all around. Later I had the opportunity to look at one of the fragments of the parchment that was brought to Israel to be inspected by experts of the Hebrew University. They expressed the opinion that this Sefer Torah had been written in Morocco by 1700. I was intrigued by this inconsistency: an old Sephardic Sefer Torah with a modern Ashkenazi mantle. I understood that this would be the thread to follow. Searching the Azores folder in my personal clippings archive I came across a copy of "Hedim", a Hebrew publication, of 1977, which had a small article, whose author also elaborated on speculations about the Crypto-Jews of the Azores. The author based his theory on a story that he read in the "Kansas City Jewish Chronicle" about a young American captain of the Lajes Air Base in the Azores, who had bought a Sefer Torah in a cafי for five dollars. No date of publication was given. It took me six years to find the right captain Marvin Feldman, now a retired colonel, living in Australia. Colonel Feldman was kind enough to give me his full story, which was quite different from what I had read. He served at the Lajes base from April 1970 to April 1972. At the time there were about 30 Jews in the Base, including military personnel, their wives and children. They used to gather, every Friday night, at the Base's chapel, where Feldman led a Shabbat service. He was not a Rabbi but had enough knowledge of Judaism and certainly the necessary motivation. Soon he was known in the local community as "the American Jew". This was probably the reason why he was approached one day by some local people who whispered to him that they too descended from Jews. This aroused his curiosity to search for other signs of Judaism in the island. Indeed he found a small cemetery and later a village known by the conspicuous name of "Porto Judeu", the Jewish Port. Marvin Feldman went to the village several times looking at each door and hoping to find signs of mezuzot. He didn't. One day he entered a bar at Porto Judeu, where old men were sitting around wooden tables drinking red wine. He also bought a jar of wine and put it on the table for his right to sit with them. Managing a little bit of Portuguese, he asked the reason why the place was called the Jewish Port. They narrated one of the several known stories of the local lore. The one they knew was that in the 16th. Century a ship carrying fugitive Jews was caught by a storm and had to put into the island of Terceira. Jews were not allowed to live in Portuguese territories, nevertheless the governor allowed them to settle in the island, but not in the main city, Angra do Heroismo. So they went up the coast, a little bit to the north and settled in the place that became known as Porto Judeu. him the address of the Jewish cemetery at Angra do Heroismo, which he had already seen. The cemetery had no relation whatsoever with those 16th century Jews. Finally one day they said to him: "We don't know where the Jews lived, but we have something Jewish for you". "Something Jewish" was a large wooden box, old and dirty, with rusted nails, which they took from behind the bar and put in the truck of his car. Feldman was astonished. He put the box in the back of his house and for several weeks he wouldn't dare open it. What would he find there? – He wondered. It looked like some sort of a coffin. Maybe he would find there the bones and the skull of somebody. What right did he have to disturb the dead? Finally one day he found the courage to open the box. Much to his surprise there was a Sefer Torah in remarkable good condition. So he didn't buy it, as the article said. It was given to him. He cleaned Sefer Torah and took it to the Base. From then on they used the Sefer Torah in their Shabbat services. and read the weekly portion. His name was Father Don Hunter. The next time a Jewish chaplain came to celebrate the Passover seder with the Jewish servicemen at the base, captain Feldman showed him the Sefer Torah. The rabbi was sure that this could only be a pre-Inquisition Iberian Sefer Torah. Probably this rabbi had little experience with Sephardic Sefarim. On Feldman's return to the United States he resisted all the requests to bring the Sefer Torah with him. He had a strong feeling that this was part of the history of the Jewish people in Portugal and that it belonged in the Azores. So he left it in its cabinet at the chapel. Feldman has checked five years ago – and I checked now by phone with the present Head Chaplain of the Base: The Torah is not there and they do not have any record of it having been there. I asked Marvin Feldman if the Sefer Torah that he found had a mantle. No, he had not when he found it in the box. But later on, when another visiting Jewish chaplain wrote to him and asked what he should bring on his coming visit to the Base, Feldman sent him the measurements of the Torah and asked for a mantle. How was the mantle? Feldman told me it was in blue velvet with yellow fringes. I sent him a picture of the mantle from Rabo de Peixe, and he said that this could well be the same. had a new clue to follow: the old wooden box. Angra do Heroismo, the main city of Terceira, had a synagogue in the house of a Mimon Abohbot, a learned Jew originally from Mogador, in the Atlantic coast of Morocco. Born in 1800, Abohbot came to Portugal before 1824. In Lisbon he was hired by a compatriot, Salon Buzaglo, to be his traveling agent in the Azores islands, based at Angra do Heroismo, Terceira. business, such as local oranges. Being the most religiously educated of about 30 Jews that lived in the city, he opened a synagogue in his own house and soon became their religious leader. For the local population Mimon Abohbot was the "dean and rabbi of the Hebrews". He led the services, delivered sermons (some of which still exist in his own handwriting), organized special services for outstanding Portuguese public events. Abohbot was socially highly respected in the Azorean community, by both Jews and non-Jews. By 1838 he had married in the Bevis Marks synagogue, in London, an English lady, Elisabeth Davis. He had also obtained the Portuguese nationality. They had seven children. After a very successful business career, Mimon Abohbot left a large fortune at his death. In his synagogue Abohbot had two Sefarim (plural of Sefer [Torah]), which he brought (or imported later) from his birthplace Mogador. His will is a declaration of faith in Judaism and a call to his descendants to continue in the same faith and to pray for his soul and for the souls of his wife and children (two of which died before him). - He wanted to be buried at the Angra do Heroismo Jewish cemetery, next to his dead children. Should this cemetery be dismantled for any reason, he wanted their remains to be carefully shipped to Mogador and buried next to his ancestors. - Should his children abandon the Azores and the island be left without Jews, he wanted one of the Sefarim to be taken to the Ponta Delgada "Shaar Hashamaim" synagogue, and the other to be shipped to his native Mogador. Mimon Abohbot died in 1875. His wife Elizabeth died in 1898. His son Jacob, was also an important personality in the social life of Terceira. But he passed away in 1916, at the age of 75, victim of tuberculosis. My first natural thought was that the Sefer Torah found in 1971 in the Terceira Island might have come from the Abohbot synagogue. 1964, that it was her uncle, Isaac Jose Abohbot, (died in 1921) who carried out her grandfather's will and shipped his last "Jewish books" to Ponta Delgada. 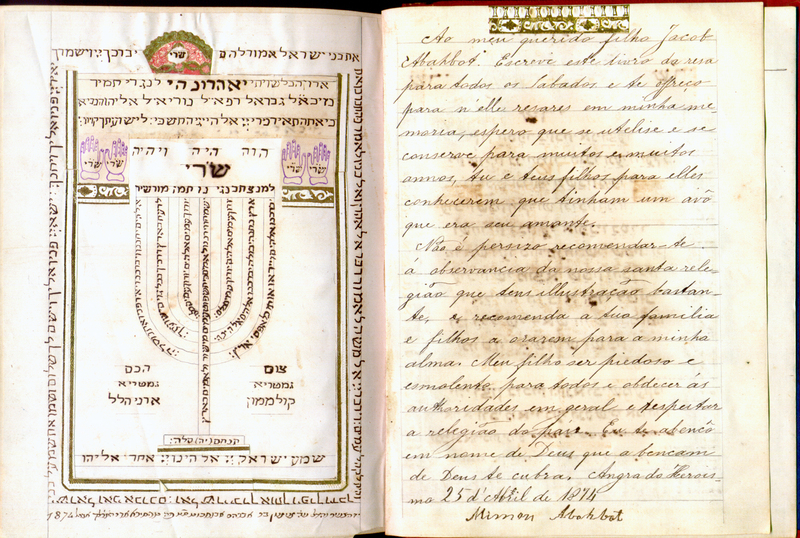 Indeed, in March 18th 1936, Salon Delmar Jr., the last "full Jew" of the Azores, wrote a letter to the then rabbi of Lisbon, Abraham Castel, and sent him a few of Mimon Abohbot's sermons, which he forgot to include in the case he had already shipped to the Lisbon Jewish Community, with all the belongings that he had received from Abohbot's heirs. He doesn't mention any Sefer Torah. Eventually, since the Ponta Delgada synagogue was still open, it might have been left there, and was one of the last three Sefarim sent to Lisbon a few years ago. Merelin has also found in a newspaper article of 1866 (?) that "other Jewish documents were packed in a wooden case and addressed to Lisbon". Which documents? If they were just papers or books, why have they not been Ponta Delgada or Lisbon? Was this the Sefer Torah to be shipped to Mogador? Almost surely there were no direct ships from Angra do Heroismo to Mogador. The case had to be shipped via Lisbon, and even from there it had probably to be shipped to another Moroccan port and from there to Mogador. Has it been waiting in Angra do Heroismo for a shipment opportunity that never emerged? Today this is almost impossible to find out. The fact is that, coincidence or not, an old and dirty wooden case, with "Jewish things" was handed in 1971 to an American Jewish officer at Porto Judeu. And inside the box there was a Moroccan Sefer Torah. Leaving this issue unsettled, we are still in want of an explanation for the reason why the Sefer left in the chapel of the Lajes Base, Terceira, was found 26 years later in a cave in S. Miguel. Until the person who hid it in the cave will come out with the truth, we can only guess. 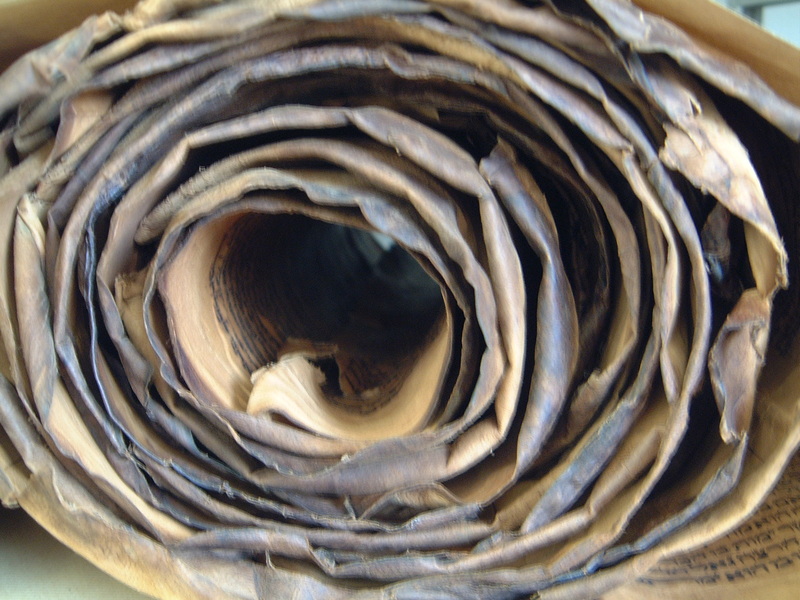 The remains of the vandalized Sefer Torah were sent to the National Library in Lisbon, to be restored. With the help of the local rabbi the fragments were put together in their correct order (some are still missing) and the whole scroll underwent a humidification treatment. One broken "Ets Haim" (wooden roll) has been repaired. It had both extremities covered with ivory. The lower extremity, the handle, was artistically lathed. The other "Ets Haim" was already missing. So they made an exact copy, but without the ivory covering.They made also a nice blue lined box for the scroll with a shelf for the velvet mantle. The government of the Autonomous Region of the Azores had classified the Torah as a "Region Heritage". 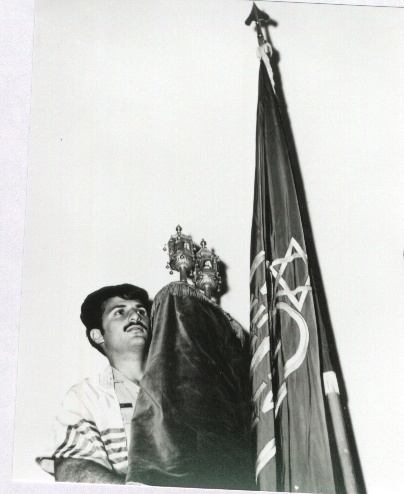 Soon it will be exhibited to the public at the Ponta Delgada Library and Regional Archive, in whose safe-room it is kept. A copy of this story is also filed there. the cave they had left also some "metallic parts" . Those were probably the silver "rimonim" that can be seen in Feldman's picture below, which were brought by the same rabbi who brought the blue mantle. Alexandre Herculano, a most reliable 19th century Portuguese historian, found in the Archives of the Ajuda Palace, in Lisbon, of which he was the director, a document that confirms part of this story, without mentioning specifically Porto Judeu. According to this document this occurred in 1501, when all the Portuguese Jews had already been forced to convert to Christianity and the New-Christians were strictly forbidden to leave Portugal. to the governor of Terceira, Vasco Eannes Corte-Real. the other in Portuguese, I read that the author, Mimon Abohbot, had copied it by hand as a legacy for his grandchildren to let them know they had a pious and loving grandfather. He asked them to pray from this book in his memory. I was moved by the fact the book came to my hands and not to the author's grandchildren. So, from time to time, I used it for my prayers, and I did it in the memory of this unknown Jewish grandfather. And I still do. My book was dated in Angra do Heroismo, Terceira, April 25th 1874. Mimon Abohbot died 16 months later, in June 1875, one hundred years before I bought his work. The last of the Moroccan Jews, because some Ashkenazi families have settled in Ponta Delgada in the 1930's, and have also left since. The records of the Lisbon community are omissive in this issue. Marvin Feldman does not remember this detail. In April 2005 my wife and I visited the Azores for the first time. I was invited by the local authorities do deliver two lectures about the "Rabo de Peixe Torah" – one in Ponta Delgada (S. Miguel Island) and the second in Angra do Heroismo (Terceira Island). Marvin Feldman and his wife Carole visited also Lajes and the Terceira island, for the first time since he served there in the 70's. We missed each other by a mere week or so. But between the two of us we found two important pieces of the still unsolved puzzle. Marvin has found that a lady Jewish Lay Leader of the Base has held the Torah until 1997, the year it was found in the cave. According to the information he received, this lady had contacted one of the synagogues in Lisbon, and eventually had sent it to them. I have checked with my friends in both synagogues and no Torah was received there in 1997 nor do they recall being contacted at that time for that purpose. Years later they received three other Torah's that were left in the Ponta Delgada synagogue. We are still trying to locate that lady Lay Leader to learn from her how and to whom she shipped the Torah. Because if she shipped it to somebody in Ponta Delgada, whothen was supposed to forward it to Lisbon, that person may have thought to gain property over the Torah, by hiding it in the cave and find it by himself the day after. But the two kids found it before he had the opportunity to recover it. This is just a guess, but it explains why the Torah was found still wrapped in a large plastic bag. And it explains why the children having left in the cave the two scrolls that resulted from the cuttings they had made – all had already disappeared the next day. The person that had put it there wanted to recover at least some valuable accessories: the ivory handles and the "metallic parts" – bells and pointer which were probably in silver. The two scrolls were found later near a football field, one being completely reeled off and the "ets haim" (wooden axe) with the ivory handle, missing. The other side was still reeled, but the "ets haim" has been broken, probably in an effort to take off the ivory handle, which he couldn't. The "metal parts" that the kids mentioned were never found. - first to Mogador, Morocco. - second to the United States, when some rabbis insisted with Marvin Feldman to bring it back with him and he refused. - third time – when the lady from Lajes had the intention to ship it to Lisbon.